We’ve been slow to catch up with the wave of live satellite relays now being offered by Eden Court. Last week, however, we made it to Rameau’s Hippolyte et Aricie from the Glyndebourne Opera Festival, and we found it an utterly engaging experience. In fact, I suspect that, for a very long and wholly unfamiliar Baroque Opera like this, the cinema experience might actually be the best way to see it for the first time, better even than being in the opera house itself. In the auditorium I could imagine my attention wandering during some of the long passages of declamation, but in the cinema, sensitive camerawork, and judicious use of close-ups, really drew us into the personal tragedies at the heart of the work. We did miss the champagne, though. So, we’d give the whole experience a gold star, except for one really surprising element. As we in Inverness waited for the curtain to go up in Sussex, Glyndebourne regaled us with advertisements for future live relays (fair enough), and also with repeated injunctions to ‘get involved’ by tweeting during the screening! As avid fans of Kermode and Mayo’s Film Review on BBC Radio 5 Live, we were horrified at such a flagrant incitement to break the Wittertainment Code of Conduct. Needless to say no-one in the small but select Inverness audience did anything so crass. The Code of Conduct started out, as many things do on this rather anarchic programme, as a joke between Mayo and Kermode, but it has been taken up by many cinemas around the world who see its ten rules, jokes aside, as simply good common sense for ensuring a pleasurable movie-going experience. For Glyndebourne to encourage its relay audiences to have their phones on at all, with all the light pollution that implies, and with the risk that not all of them will be set to ‘silent’, was really astonishing. I have written to complain! But I think there’s a deeper philosophical issue here. ‘Get involved!’ exhorted the Glyndebourne advert, but surely, any audience member who is taking the time to compose and send a tweet is absolutely not involved in the gripping tragedy and the surreal spectacle unfolding on the screen. Certainly, over three hours and 45 minutes (including interval) I didn’t find my own involvement weakening for a moment, whereas during the film of Les Miserables a few weeks ago I was so bored I could have composed an entire novel in 140-character tweets. Mark Kermode even argues that it would be wrong to tweet or text during a film screening, even if you were the only person in the cinema, because it shows disrespect for the film-makers. While that rather Zen concept may be taking things a little far, I sympathise with his position. But we have to recognise that history is on the side of the tweeters. Gustav Mahler is credited with the practice of dimming the house lights during the overture of an opera, and then keeping them dim throughout the performance, and that was only at the start of the last century, when electric lighting made such an approach feasible, and it was initially resented by the audience. Prior to that, of course, the opera house was a place to go to see and be seen. French Grand Opera always had a ballet scene in the third or fourth act because that was when the members of the Jockey Club would turn up and expect to be able to see their favourite dancers. Hence, for example, the very rarely performed ballet scene in Verdi’s Otello. One doesn’t imagine the chaps from the Jockey arrived and left in sensitive silence. It’s often said that it is unwritten codes of conduct that discourage many people from attending concerts, plays, opera and ballet: they’re worried about being made to look stupid because they might do the wrong thing—like applauding between movements. Yet the performers themselves can often be those who are most resistant to change. At the BBC Proms last week musicians were suffering from the heatwave, especially those involved in performing Wagner’s mammoth Ring cycle. In the liberal informality of the Proms, the audience could be in t-shirts and shorts, and several of them encouraged the musicians to discard their white ties and tails and do the same, but it’s the musicians themselves who defend their formal garb, saying it helps to create a sense of occasion. And of course it is actors who are doing most to fight the menace of the mobile phone, often making up for the pusillanimity of theatre managements, as regular news reports testify Even more difficult is the situation of music venues that keep their bars open during the performance. A few years ago the great Steve Earle famously lost his temper at an Ironworks gig in Inverness, with a group of drinkers who would not shut up during his solo set. So, am I making a Canute-like gesture in complaining to Glyndebourne? Should I accept that my wish to be profoundly moved, to be taken out of myself, to forget my surroundings, is the product of a relatively short period in cultural history, and that the tweeters, the chatterers and the drinkers are just the modern equivalent of the audiences that bought oranges from Nell Gwyn in 17th century London, or formed the notorious claque in 19th century Paris, or cheered on loquacious music hall MCs less than a century ago? Does the social trump the personal? Perhaps not. We’ve just been discussing how it no longer seems quite so cool to be ‘cool’, or an airhead, and that geeks and nerds are becoming more fashionable. So perhaps in future I may not need to long for the power of Ludwig II of Bavaria, who could command entire productions of Wagner’s operas for which he was the sole member of the audience. 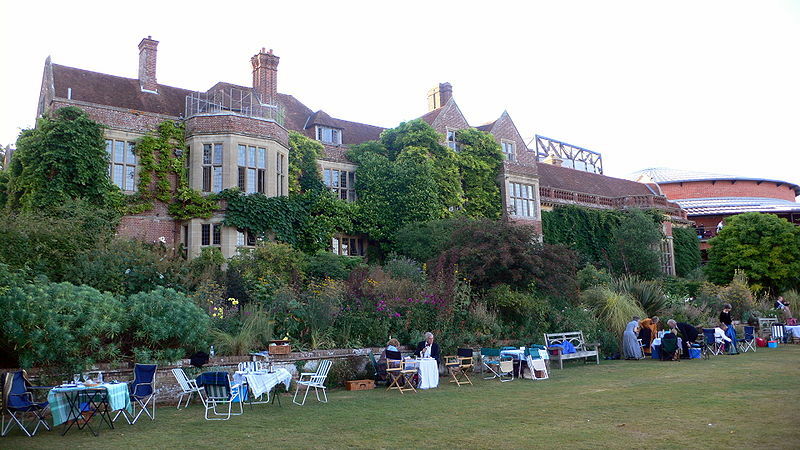 In the meantime, Glyndebourne really should think about adopting the Code. Living in the Highlands, there’s very little that we miss about the Central Belt, except for the chance to see major art exhibitions. The team at Inverness Museum and Gallery often achieve wonders with their limited resources, but that doesn’t remove the need for a regular fix—usually in Edinburgh, as Glasgow has fallen badly behind ever since the magnificent MacLellan Galleries were mothballed. One of the early tasks I was given on joining HI~Arts in 1994 was to write the brief for the very first formal feasibility study into creating a major gallery for the Highlands and Islands. I used to hope then that I’d see such a gallery open before I retired. Now it’s only the shifting ages for claiming the state pension, and the poor state of my personal pension, that are keeping that possibility even remotely open. In the meantime Edinburgh can still offer some fantastic exhibition experiences, especially through the National Galleries and Museums. We always make sure we get down for the Festival exhibitions, so we were initially disappointed that, having to be in Edinburgh for a meeting last week, we were just too early for most of those blockbusters. But that turned out to be a blessing in disguise. In the first instance, this encouraged us to visit the kind of lesser display that can so easily get overlooked when the great crowd-pullers are open, Through American Eyes: Frederic Church and the Landscape Oil Sketch . Not the most stimulating of titles, perhaps, but this proved to be the kind of small but perfectly formed exhibition which, in just one room and some 25 small pictures, can be both a revelation and a source of intense pleasure. Frederic Church is known here (insofar as he’s known at all, that is), for the Scottish National Gallery’s epic Niagara Falls from the American Side but this exhibition showed his miniature side, and what an incredible eye and technique he had. The exhibition is on till April next year, so you’ve no excuse if you miss it! And it’s free! And better still, on the way to see the Church exhibition, we stepped into the little hexagonal room on the ground floor of the National Gallery that is the permanent home for seven of the greatest paintings ever created—perhaps the greatest paintings in any collection in Scotland: Nicolas Poussin’s Seven Sacraments. Now I’ve known these paintings all my adult life, and had we been trying to fit in various exhausting major exhibitions on this trip, we’d hardly have spared the time to revisit them, which would have been a shame, as I found the experience very moving. How can I persuade you of the true greatness of these paintings? It’s not an easy task. Unless you’re a fairly well briefed member of the Catholic Church, the subject matter is obscure, not to say recondite, and not immediately easy to relate to. Then, the paintings are now mostly very dark, due presumably to aging varnish and a certain amount of fading pigments, and so don’t make an immediate impression on the viewer. And, most significantly, these are supreme examples of French Classicism, contemporary with the plays of Racine, the music of Lully, and the first phase of building at Versailles—a style, a philosophy, a world, that are probably as far from contemporary taste as anything in the last half-millennium. Even as an art history student I didn’t take readily to Poussin; in fact I think I graduated without really understanding his achievement. I was put off by the solemnity of his religious subjects and, paradoxically, by the frivolity of many of his mythological themes. It took a lot of looking, and some great exhibitions, including the Scottish National Gallery’s own landmark Cezanne and Poussin of 1990, to change my mind. And I clearly wasn’t alone in having this problem: researching this blog I was amused to find a 2009 Guardian article titled ‘Arts snobs can keep Poussin’. Well, maybe I am an art snob, but my admiration for Poussin now goes well beyond the intellectual or the academic. I quite simply love his paintings, as profoundly as I love the music of Bach, or the poems of John Donne, to mention two other artists in other artforms who can be thought ‘difficult’. Let’s return to the Sacraments, and look at just one of them, Holy Eucharist. 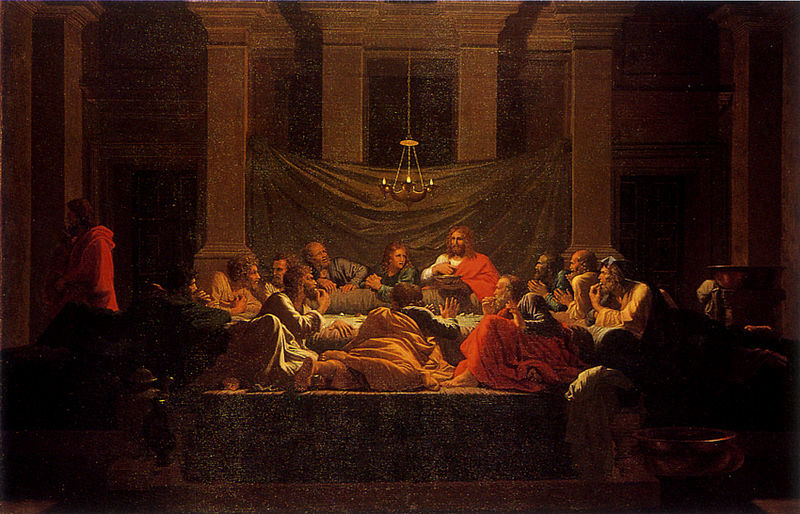 Forget Leonardo, this is the ‘Last Supper’, not least because it makes such a concerted attempt to re-imagine the scene, starting with having the apostles, in a historically correct manner, reclining on couches on three sides of a table, rather than lined up all in a row. Yet there are still hurdles to overcome. Historically correct the scene may be in one sense, but hardly for a bunch of Galilee fishermen in an ‘upper room’. Christ at first sight seems too idealised, while too many of the apostles’ heads seem to have the rigidity of classical tragic masks. But set that to one side: look at how naturally everyone is posed, and look especially at their reactions. Jesus has obviously just announced ‘One of you will betray me’ and many of the apostles are caught literally with their mouths full, or with the next bite half way to their mouths. It has the vivid immediacy of a film still, an effect enhanced by the astonishing lighting from the central (and again archaeologically correct) hanging lamp, and especially by the figure of Judas, slipping out to the left. But these elements are easy to describe. What’s much harder to convey is what makes Poussin really great—a pervasive and intense sense of human empathy that, curiously, is heightened, not diminished, by the classical manner, and a truly musical sense of form and structure. Goethe called architecture ‘frozen music’ but I think the phrase could equally be applied to Poussin—after all one of his most famous paintings is A Dance to the Music of Time! So, the only way to ‘get’ Poussin, I’d argue, is to look, look, and look again, and keep coming back. The rewards repay the effort. 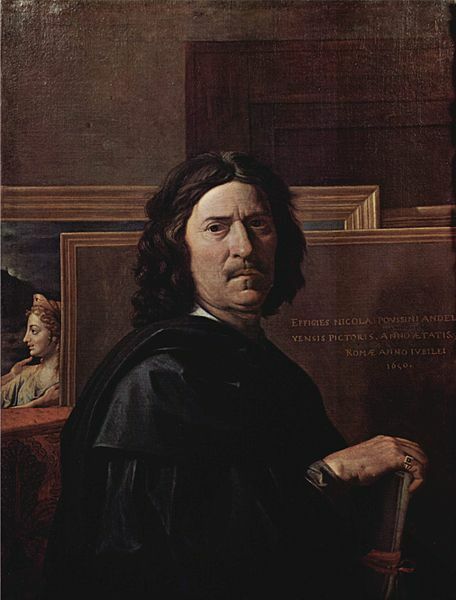 And so the real problem with Poussin is that he demolishes two arguments that are increasingly gaining ground: that art should be easily (if not instantly) accessible, and that art, especially of this kind, is elitist and those who want to enjoy it should pay for their pleasure. Good art takes time, and that’s why galleries need to be free. And why we need a really good one in the Highlands! Are you a Trekker? If so, which Star Trek series do you prefer? Although I can’t avoid feeling nostalgia for the original Shatner/Kirk series with which I grew up, I do have to admit it now looks pretty creaky, and I prefer its sequel, Star Trek: the Next Generation, chiefly due to the admirable character of Captain Jean-Luc Picard, played with such quiet authority by Patrick Stewart. 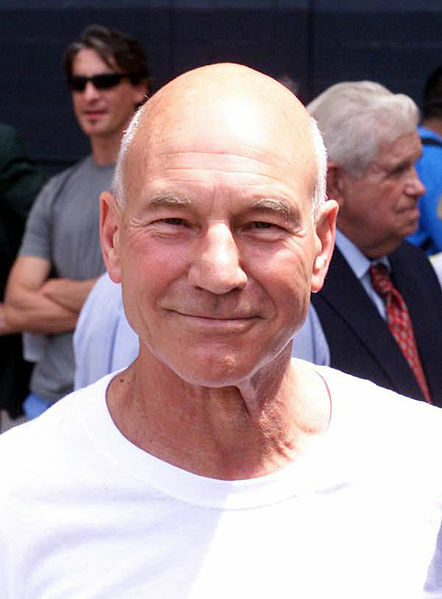 Mind you, I was already a Patrick Stewart fan. As a schoolboy I had been taken to Stratford (overnight coach both ways!) to see Richard III, and in a powerhouse RSC cast that included the late Norman Rodway and Ian Richardson, and a luminous Helen Mirren, the youthful but already balding Stewart had held his own as an actor of real presence and integrity, qualities that have sustained his entire career. He popped up in a different role on our TV last week, as we caught up with recordings Nicholas Crane’s second series of ‘Town’. This episode was on Patrick Stewart’s home town of Huddersfield, where he has been Chancellor of the University since 2004, and by the time he appeared towards the end of the programme, extolling both town and university, we were ready to cheer him on. In fact, Crane had presented such an inspiring picture of the architecture and the people of Huddersfield that we were ready to jump on the next train south and remedy a lifetime’s neglect by finally visiting the town. One of the peculiarities of Huddersfield is that despite, with a population of 146,000, being considerably larger than many formally designated ‘cities’, it has never sought that city status. The good folk of Huddersfield seem content with their town-ness, and one wonders, what are the virtues of being a ‘town’ that they want to hang on to? (Inverness, are you listening?) For the past few months I’ve been a member of an External Advisory Group to the Scottish Government’s Town Centre Review, the report of which was published earlier this month. Inevitably, I don’t agree with everything that’s in the Review, but the process of working on it has been eye-opening. Half of Scotland’s population live in its 500-odd towns, and yet those towns rarely seem to benefit from any specific and focused Government strategies or policies. There have been Six (and now Seven) Cities Initiatives, and I’ve spent most of the last 20 years focusing on rural initiatives, but towns often seem like poor relations, as if there was something inherently dull or old-fashioned about the very idea of a ‘town’–exactly the prejudice which Crane’s series is trying to overturn. It doesn’t help that the concept of ‘town’ is a wide and slippery one. Like Huddersfield some Scottish towns–Paisley, East Kilbride–are considerably larger than the three new cities of Inverness, Stirling and Perth, but there are also anomalies at the other end of the scale. I realised, writing this, that I have never actually lived in a town, although we’d spent twelve years in Anstruther, which is usually referred to as a village despite, with 3,600 people, being larger than many so-called towns. Of course there are many handsome and prosperous towns in Scotland–St Andrews, Banchory and North Berwick are among those I know well–but the ‘problem’ towns are not confined to the obvious post-industrial areas such as Ayrshire or West Lothian. Rural Perthshire towns such as Crieff and Aberfeldy, for example, have suffered from the steady retreat of their commercial sectors, while many Border towns are affected by their ready access to the metropolises of Glasgow and Edinburgh. That the arts can play an important role in reviving a flagging town has been amply demonstrated by Wigtown (book town), Kirkcudbright (art town) and West Kilbride (craft town), but also, without the need for such formal designations, by the development of cultural facilities, such as An Lanntair in Stornoway or the new Beacon in Greenock. But what some of us were trying to argue in the Town Centre Review is that a cultural approach to improving our towns needs to go much deeper. More technical interventions, such as changes to the process of business rates, or getting more town centre properties scheduled as residential, are only really going to be effective, we argued, if applied in the context of a thorough understanding of the different culture of each town—its history, how it grew up, the stories its inhabitants tell about it, what its young people think of it. That after all is exactly Nicholas Crane’s thesis: that towns can be the machines for living in the future, that they can be capable of change and adaptation, but that you need to understand where each individual town is starting from to kickstart such change. For me, that message doesn’thatmachines for living in the future, that that can be capable of change and adaptation, but that yt come across quite strongly enough in the Review’s final report, but at least it’s a start. Now we just need someone with sufficient authority to take the Review’s recommendations and declare, in the immortal words of Jean-Luc Picard, ‘Make it so!’. Redundancy has its compensations. On Wednesday afternoon the clouds at last parted and some real, bright, life-enhancing sun broke through. No longer confined to an office (albeit one from which I could see Ben Wyvis) I took myself off for a walk in Reelig Glen . When we first moved to the area in the mid 90s the walks in Reelig Glen were unsignposted, and mostly known about by word of mouth. 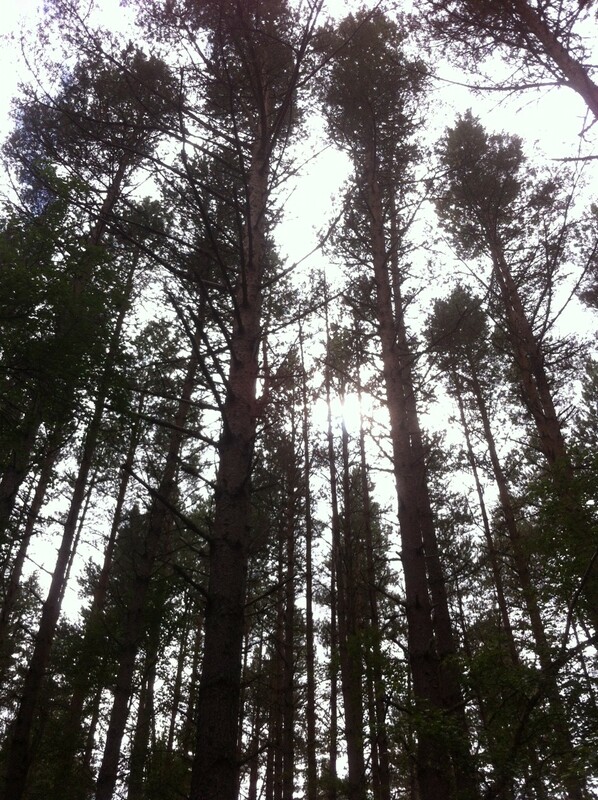 A few years later it became a designated Forestry Commission walk, with roadsigns and information panels. I ought to approve of the greater access but I’m afraid I miss that sense of it being a rather secret place, and, of course, as it’s now advertised, FCS have to ensure that it’s also safe, which has taken away some of the wildness and the (very mild!) sense of adventure. But it is still breathtakingly, throat-catchingly beautiful. Reelig Glen was a possession of the Frasers for 500 years until sold to FCS in 1949, and it owes much of its present appearance to one member of the clan, James Baillie Fraser, who planted the gorge of the Reelig Burn in the 1850s with specimens of the exotic trees being brought back by Scottish planthunters, such as David Douglas, whose eponymous firs are among some of the most spectacular (and tallest) trees in the Glen today. 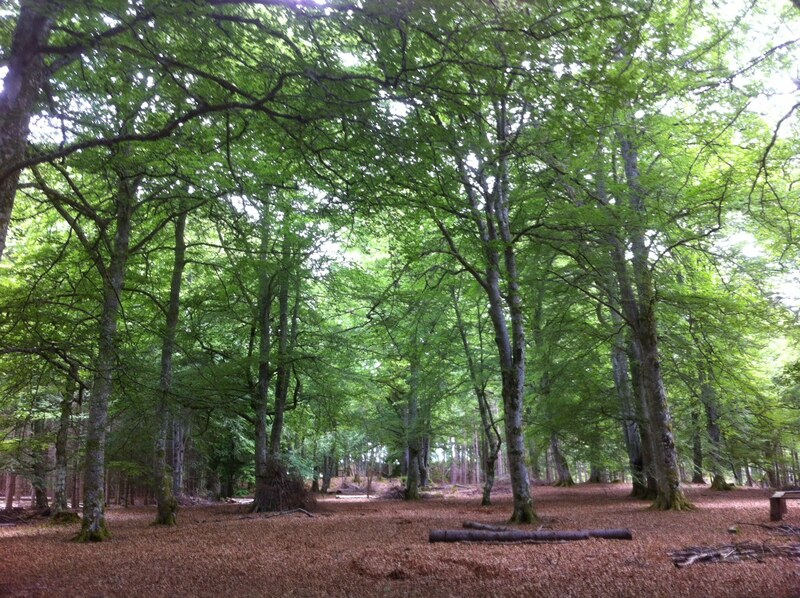 The upper slopes of the woods are now in the care of the local Community Woodland group, and include a beech ‘cathedral’ that is profoundly impressive at all times of year. ‘Glory be to God for dappled things’ wrote Hopkins, and there were plenty of dappled things in Reelig last Wednesday. I love the Glen at this time, when everything is at its most lush, green and overgrown, and the afternoon sunlight really brought out all the different, dense layers of foliage, especially where a break in the canopy opened up views across the gorge to the opposite slopes. The trouble with writing a weekly blog is that you’re always on the look-out for material, and so as I trudged the paths I was wondering how I could tie this open-air experience into a blog about culture. True, I did have a heart-stopping Helen Mirren/The Queen moment when a doe broke cover about 20 yards ahead of me and stood still for a few moments, as we carefully regarded each other, but that’s not quite fertile enough blog material. So I thought about why I like Reelig so much, of all the many lovely walks in the vicinity of Kirkhill, and I decided it was all to do with complexity. I take an intense, immediate, sub-verbal pleasure in the extraordinarily dense prospects available round each corner of the walk: the foliage and branch patterns of a dozen different types of tree, the overlapping effect multiplied by the slopes, and then the thick ground cover of the undergrowth. This is an effect, of course, that can be equally powerful in wintertime, with the added contrast of bare branches against evergreens. It is complexity, not chaos. There are no less than three underlying levels of order. First, there is the original planting of over 150 years ago, and that has created a scaffolding on which a flourishing ecosytem now operates. And of course FCS staff apply discreet nips and tucks to keep paths safe and clear, and picturesque vistas open. So there are patterns at work here which, with enough information, could explain exactly why that one particular branch has grown in that direction and taken that shape. And thinking about this made me realise how much I respond to complexity in art and music. I love paintings like Altdorfer’s The Battle of Issus in which, reputedly, no-one has yet counted how many figures are depicted, or poor, mad, Richard Dadd’s The Fairy Feller’s Masterstroke , or, closer to the Reelig experience, the paintings of Jackson Pollock. And I’m always drawn to dense counterpoint, whether in Renaissance polyphony, the fugues of Bach, or a Mahler symphony. I’m also fascinated by composers for whom conventional instruments just don’t offer enough complexity, such as Conlon Nancarrow who would painstakingly punch holes in player-piano paper rolls to create pieces that sound as if they’re being played by ten hands at one piano, or Pierre Boulez, who combined the resources of a modern symphony orchestra with a whole additional layer of electronic sound in works like ‘Repons’. Judith finds such music instills in her a sense of panic, and I’m sure that’s not an uncommon reaction, but I find it exhilarating. I wonder how far this is a modern phenomenon. After all, until Capability Brown introduced the concept of the picturesque into the planned landscape, parks and gardens were rigorously formal and orderly and, if complex, were so in a geometrically definable way. And it took the Romantic movement, spurred by Burke’s essay on the Sublime, to find beauty in rugged and natural landscapes that, in previous generations, would only have instilled fear and repulsion. Have we adapted, culturally, to cope with the increasing complexity of our modern world, and even to enjoy it, or have our brains actually developed a new ability to process such complexity (in the way that London cab drivers have been shown to have physical changes in their brains as a result of learning ‘the Knowledge’)? Either way, it means that the kneejerk reaction of the average TV producer, to reach for some ‘English pastoral’ music to overlay images of places like Reelig Glen, may be downright wrong, and the rich complexity that sees apparent chaos emerging out of a variety of pattern sources, might be better represented by something like Elliot Carter’s Variations for Orchestra !